#Ethereum's volume is less than 10% of #bitcoin's, instead of 50%. That's a large difference that will affect all eth based tokens as well. #Ripple $XRP's volume is another 70% lower than Ethereum's. A new bug found in Constantinople, again. "A new bug in ethereum’s Constantinople upgrade has been found at the last minute, with it affecting a limited number of smart contracts that utilize self-destruct." Jason Carver, a developer at the Ethereum Foundation (EF), says a new feature called Create2 can allow a developer to replace the self-destructed contract and thus change the rules. This could be a quiet attempt at resurrecting the Parity funds, still locked in a contract due to the self-destruction of a library. A little economic comment on this mind-blowing hack with DNA. I've always been uneasy about the price tag associated with these tests being so low. $50 US to sequence your DNA is uncorfartably cheap. They must be making money elsewhere. As it turns out, they are. And this is the one we know about for sure, it's likely all are doing similar or worse things. Packet switching is the technology behind internet. Internet maximalists are toxic. There will obviously be multiple global packet switching standards. The key to scaling global packet switching networks is right governence model. Comparing lightning network to a base layer consensus mechanism is ignorant. Proof of stake has been debunked many times over. Quick thread. 2/ PoS is a perpetual motion machine. Money is not a shared illusion. It's a shared observation. We observe a thing is scarce and secure as it withstands attacks and remains robust and unaltered. Perpetual motion machines are *not* Byzantine Fault Tolerant btw. A real "dApp" is a very rare thing. So rare they can easily have their own names, like Bitcoin and Lightning Network. As a idea, apps that label themselves dapps, is pretty funny. Mainly, they call themselves dapps to excuse their lack of users and to confuse their investors. There are no dapps on ethereum, except maybe the erc20 contract itself I guess. Can the altcoins handle the coming pain? How many holders of last resort do they have? Altcoins have built their networks on marketing and false narratives. Reinflating an altcoin bubble is without deliverables is going to be impossible. Bitcoin delivers its value prop everyday. It delivers more valuable innovation all the time. It's network effects will continue expanding, while altcoins' will shrink to nothing. The term "cryptoassets" (conveniently the title of Chris's book) is hugely detrimental to investors' understanding of digital scarcity and sustainable comp advs in this tech. The term scam, however, is *under used*. Ripple is the #2 coin by market cap for God's sake. The entire altcoin complex would benefit if people were less forgiving of the 99% that are outright scams. It feels very similar to the coinbase "education" initiative, that just fills your head with buzzwords like blockchain and cryptoassets, then they try to sell you their scams coins, that have no competitive ad except for pumpers and shills. People claim PoS is very superior to PoW, and cliam #ethereum has so much dev power, yet they can't pull off PoS after 4.5 years!? #Ethereum no yet going PoS is a laughing stock. They know it's dumb. They know it will destroy the network. They don't want to exit their scam yet. Trouble in paradise. 'Why can't you upgrade the 747 in flight faster!?' Not to mention the upgrade is theoretical at best. Ethereum dependent apps are feeling major pain. They have near zero users and a network that can't scale. Plasma has stalled, PoS is scary, payroll due. App/ICO/devs, why not take a look at @RSKsmart? 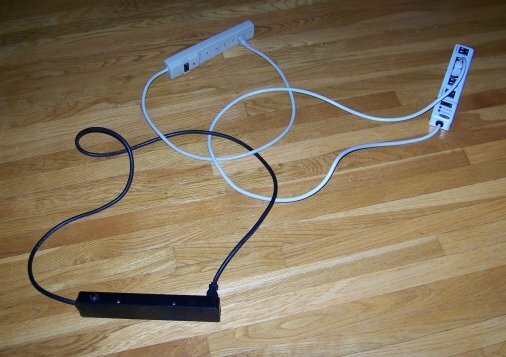 It's an ethereum ported onto a layer 2 of bitcoin. Tldr: Listening to #bitcoin maximalists would have saved your company $ billions, with not chasing blockchain magic. Like I've said for yrs, central planners & their apologists couldn't bring themselves to admit sound money & crypto-anarchism were primary reasons behind Bitcoin's success. They had to attribute its success primarily to a technological leap, "blockchain". 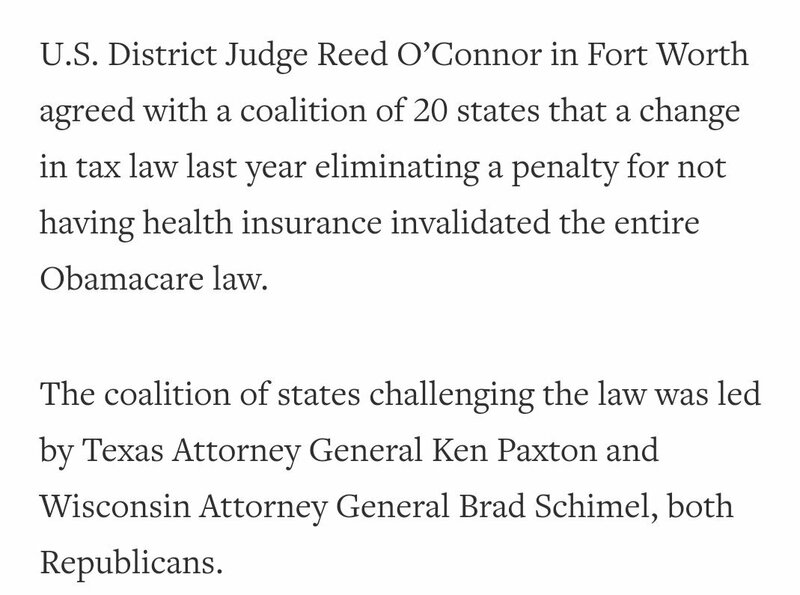 #Obamacare ruled unconstitutional by a Texas district judge. Eliminating the penalty for not having health insurance last year, now seen an invalidating the entirety of #Obamacare. "In some ways, the question before the Court involves the intent of both the 2010 and 2017 Congresses. 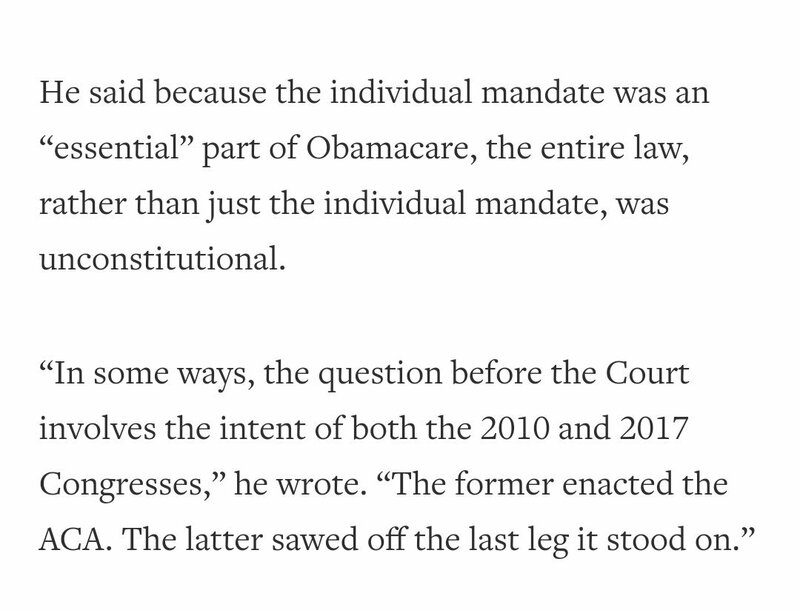 The former enacted the ACA. The latter sawed off the last leg it stood on." Take this as a lesson politicians. If you want to be head of your political party, shutdown the government. I have to say, if politicians had principles and this was real gridlock, it'd be fantastic. Less government x2. Erik is trying to reappropriate the term maximalism, back to its original pejorative meaning of a non-thinking cultish brute. "loyal" and "desire" emotional responses, devoid of thought. Maximalism however has changed to mean Bitcoin rationalism. It's funny when people use Ethereum Maximalist, because the only defense is "let the market decide", "it's being worked on". Which of course, bitcoin maximalists totally approve of, even if our better, well-reasoned arguments don't penetrate the brainwashed blockchainers. Bitcoin maximalists don't "desire a blockchain monoculture", however, I personally do desire people lie less about their projects. Bitcoin maximalists predict convergence of money and communication protocols. I'm also a TCP/IP maximalist for many of the same reasons. 2/ It's quite weak to say, "most products won't be bought if people have a higher propensity to save," because that's admitting most products are only bought now because of inflation. 3/ Of course, that's not true for many items today. They are bought and/or consumed because they are productive in some way. #Bitcoin will be spent on productive goods. No one can rationally claim that people would rather save than survive. So goes the stupid hash war. Bcashers got tired of reality, I guess. Now they want to hide behind centralization and lies again. The same people that didn't understand why bcash would fail in the first place, couldn't understand the arguments involved this time either. Everyday is a hash war. Their toy networks got a taste of the real economics Bitcoin deals with daily. And how did the ignorant bcashers deal with this dose of reality? Let's see which altcoins change their networks in an attempt to save themselves, directly undermining any store of value potential. Bitcoin's future value is dependent on its independence, lacking any central planner that can change it for marketing purposes. Bitcoin is different. Its very value proposition is absolutely unchangeable fixed supply. All the cries about bitcoin not being unique, simply one of 1900 coins, misses this fundamental fact, there's always a most robust consensus. Everything else is weaker than bitcoin, hence bitcoin will continue expanding its lead. The only thing that makes the #bcash #bch drama exciting how centralized it is around a few key players, like Bitmain and their 1mil bch bags. They'll do anything to pump those bags, but it's not real. The most valuable #bcash fork would be the one that doesn't change, since long term value comes from long term confidence, not short term feature improvements. The sum of the two *new networks*, rogercash + SVcash < original #bcash network. Holding both forks is objectively worse than dumping the loser and buying the winner. And since it's so centralized, it should be easy to predict the winner. Idiots thinking they'll double the total value by holding, will get relatively rekt. 1/ There was no second great bubble in the early internet protocol wars. Tcp/ip slowly won as the early enthusiasm of competing project lost steam, converged or died. 2/ Sure, there's some different dynamics at play in altcoins today, because they can literally print their own money. The timeframe might be different, but the efficiencies of converging on one standard of communication and value are so great, it will happen. 3/ Altcoins will lose steam, converge onto Bitcoin, or die. Like communication protocols before, there's no need for every use or every business idea to reinvent the wheel. Beware of fast talking money managers and their narratives, especially about #bitcoin. Often the best read on the market comes from an insightful saver. Longer timeframe trends trump single cycle targets. The nature of the money trumps narratives from research data. If a good is profitable to produce, an entrepreneur will make it, including what is used as money. Examples, Venetians made West African glass beads, and New Spain's silver mines. The value of a utility token can be viewed as that service's marginal revenue. The marginal cost of forking the code or competing for that MR is near zero. So eventually, the value of every utility token will approach MR = MC. Features aren't scarce. 7 Minute Abs is genius, until some comes out with 6 Minute Abs. Competing on features is the quickest way to obsolescence. Btw, privacy is a feature that can be iterated and improved, too. Two monies in an economy means twice as many prices to mentally manage. Two monies in an economy also adds complicated conversions for simple economic calculations. Two monies in an economy will also each have complex fundamentals in their own right, compounding difficulty of economic calculation. $133M raise by the fiatcoin Basis already puts it very close to a top 50 coin. Imagine all these #blockchain pilot programs we've seen in the last 2 years, switching $billions into fiatcoin projects. Fiatcoins totally destroy the narrative of most legacy altcoin projects imo. As the "decentralized" and "blockchain" buzzwords die, most projects will simply fizzle out. We could also see application specific Fiatcoins, as they try and reinvent the wheel for each project. It's going to get weird. An ounce of prevention is worth a pound of cure. The food pyramid has destroyed the healthcare system in the US. It's pretty simple, eat healthy food, have lower healthcare bills. Since the US has no single strong ethnic diet infused with ancient knowledge, all diets went into the melting pot. Out came the standard American diet of processed imitation carb garbage. This is what I refer to as *fiat food*. Not only is it prescribed by government standards, it lacks nutritional value, and embodies high time preference.